I think we should settle this using a very pragmatic, mathematical solution: adding up pros and cons that are entirely objective and have nothing to do with my personal taste, background, or thirst for holiday affection. Cool? Cool. We have to watch Alan Rickman be a sleazy ball of sleaze and cheat on human perfection Emma Thompson. I can’t deny that this is a huge bummer. Meanwhile, Mark (Andrew Lincoln) is starring in his own movie, Friend Zone Psychosis. His crush on his best friend’s wife is so debilitating, his only recourse is to be sort of rude to her all the time but act surprised when she, you know, notices. I know what you’re thinking: Brittany, aren’t you going to say anything about the problematic female characters? Nope! They’re all perfect angels. Especially Natalie (Martine McCutcheon), who is so charming I want to murder her. What? Of course I didn’t buy a red winter coat last year because hers looks so good in this movie! That would be insane. Martin Freeman and Joanna Page’s storyline gets cut whenever this is played on cable. That is definitely a con. Billy Bob Thornton creeps me out. I think it’s the eyes. He’s seen some things, you know? He’s seen some things. Every character has a really cool job and/or lovely home, and I didn’t come here to be mocked. The soundtrack is perfect. Joni Mitchell and The Beach Boys? I can’t. On a related note, we get to watch Hugh Grant dance with the grace and enthusiasm of a dad eager to embarrass his family on vacation. 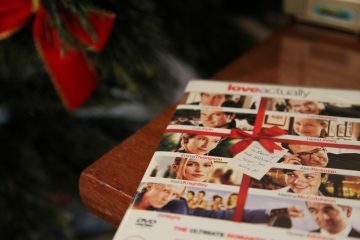 Colin Firth wears cozy sweaters the whole time, then makes a declaration of love in broken Portuguese to wrap things up. What more are you people looking for?! These actors can swear beautifully. Again, don’t watch this on cable. You miss so much nuance. There’s an airport chase scene, you unfeeling monsters. Every time you watch this movie, it’s a new a chance to prove to your friends and family that you, too, can hit that high note in “All I Want for Christmas is You.” They love when you do that! It’s tradition! And Liam Neeson doesn’t have to hunt down a single criminal. Well, I guess that’s settled. Fair is fair, and I remain right about everything. Happy holidays!